Popular belief holds that Tewkesbury began life as a seventh century hermitage founded by a Saxon monk called Theoc. The town was originally called 'Theocsbury', which later morphed into Tewkesbury. This historic market town sits at the confluence of two great rivers, the Severn and the Avon, a quirk of geography that has restricted outward expansion and led to an unusual amount of tall buildings. Over three hundred and fifty of these buildings are listed as possessing remarkable architectural and historic interest. The famous Tewkesbury Abbey is perhaps the most arresting. Founded in the 8th century and re-built in the 11th the Abbey is the third largest non-cathedral church in Britain. The tower, measuring a colossal 46 meters high and 14 meters wide, is the tallest surviving Norman tower in the world. The Norman choir and transepts probably represent the first four-storey buildings in Europe. Inside the main body of the church are 14 enormous Norman pillars, each measuring 30ft high and 6ft wide. The choir windows include stained glass dating from the fourteenth century and there are more medieval monuments here than in any church except Westminster. 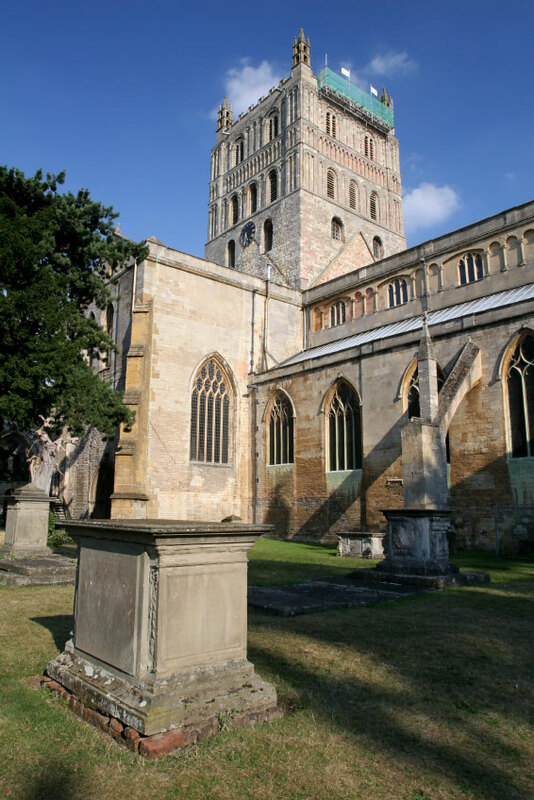 Tewkesbury Abbey was among the last of the monasteries to be dissolved by Henry VIII, and in 1540 it was saved from destruction by the townspeople who raised the money to buy it from the crown for £453. Tewkesbury Abbey, which continues to function as a parish church, is renowned across the globe for staging high-quality musical events. This spectacularly large indoor open space boasts top-class acoustics and is often used by the BBC for recording concerts. There are regular organ recitals by internationally renowned organists who come to use the famous Milton and Grove organs, and each year the Abbey is the scene of a week-long festival of sacred music; Museo Deo Sacra. The Abbey grounds are also put to good use and host a number of outdoor theatre events as well as the annual food and drink festival which was established in 2005 and seeks to promote food and drink from regional producers. Tewkesbury achieved much of its prosperity as a result of its location on the banks of two rivers, which enabled it to become a centre for milling and transporting corn. The original Abbey Mill, built by monks and with foundations dating back to the 12th century, managed to escape dismantling during the dissolution. Once thought to be the largest and most modern flour mill in the world it has long been converted into houses. The newer Healings Mill, a typical Victorian warehouse factory built by Samuel Healing in 1869, closed in 2006, thereby ending at least 800 years of milling in Tewkesbury. The Abbey cottages also escaped dismantling and were rescued from dereliction in the 1970s. Most of them, too, have been converted into homes, although they also house two museums, the Little Museum, which is laid out like a typical old Medieval merchant's house, and the John Moore Countryside Museum. This natural history collection commemorates the work of John Moore, a well-known writer, broadcaster and naturalist who was born in Tewkesbury in 1907. A third museum, the Tewkesbury Museum, is housed in the same building as the Tourist Information Centre, and features displays on the social history and archaeology of both Tewkesbury and the Cotswolds. Other buildings of interest in the town include Gloucestershire's oldest pub, The Black Bear, which was built in 1308, and the Baptist Chapel, which was restored thirty years ago and is thought to be one of the first Baptist Chapels in England. The building, which dates from the 15th century, was adapted in the early 17th. The House of Nodding Gables, an early 16th century timber-framed affair to which a third storey was added in the 17th century, is also worth a visit. The famous nodding gable was caused by a break in the ridge pole of the new structure, causing it to slip forward. Tewkesbury's geographical location lent it obvious strategic importance and the town suffered great losses throughout history, particularly during the famous Battle of Tewkesbury, one of the fiercest of the Wars of the Roses. The battle took place on the 4th May, 1471, in a field just to the south of the town that has been known as Bloody Meadow ever since. Following the Lancastrian defeat those who had not already been slaughtered fled to the church whereupon Abbot Strensham intervened to stop the massacre. Unfortunately for the survivors, who numbered among them the Duke of Somerset, he handed them over to Edward IV who ordered their execution at the Market Cross. One of the victors of this particular battle was the Duke of Gloucester, later to become Richard III. During the Civil War, like many Cotswold towns, Tewkesbury changed hands numerous times. Charles I began his siege of Gloucester by requisitioning every pick, mattock, spade and shovel in Tewkesbury for use by his army. Today's Tewkesbury represents a fascinatingly well-preserved slice of Cotswold history in the context of a bustling market town. The newly re-opened Roses Theatre combines an art cinema with a live performance venue. Every Wednesday and Saturday the town's central car park plays host to the Tewkesbury Market. The Abbey grounds see a monthly farmer's market and each February the annual beer festival takes over the pubs and bars. July sees the annual Tewkesbury Medieval Festival, which is billed as 'Europe's largest battle re-enactment and fair'. The festival attracts people from all over the country and beyond, keen to re-enact the Battle of Tewkesbury and wander through the recreation of a medieval encampment, with furniture, clothes and weapons on sale.